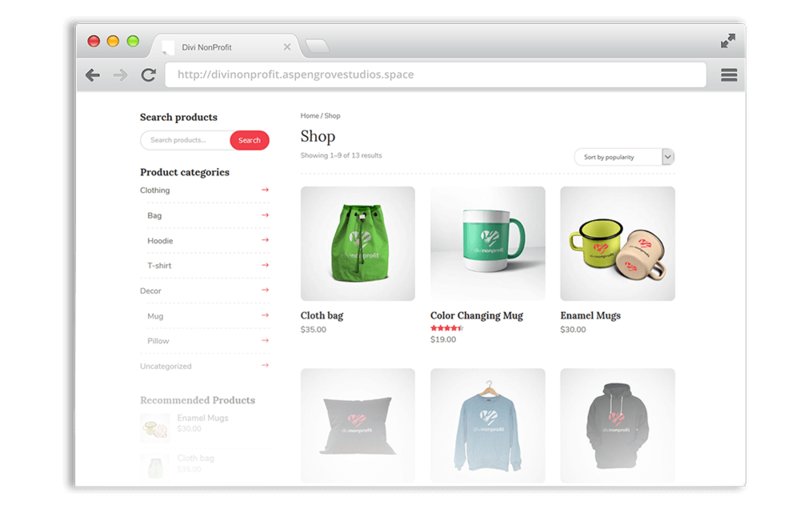 Designed to help organizations make their mark on the world, Divi Nonprofit is a multi-functional, deeply feature rich and simply beautiful child theme that’ll help nonprofit organizations and businesses of similar esteem communicate their offering and achieve their goals. 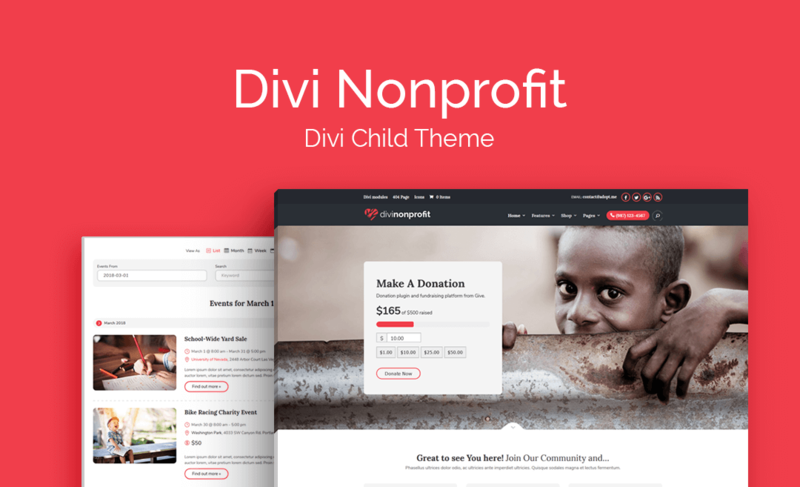 Aesthetically striking and functionally flawless, the Divi Nonprofit child theme offers organizations the chance to communicate effectively and present a truly engaging website to their audience. Satisfying a range of possible marketing strategies, the Divi Nonprofit child theme’s got it all. 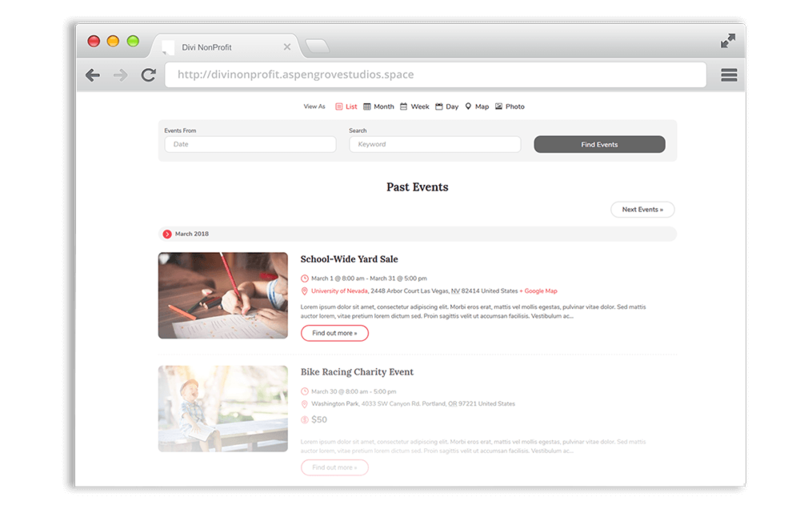 From events to e-commerce, donations, custom project templates to showcase you great deeds, content publishing and more, Divi Nonprofit comes complete with a plethora of advanced features, each carefully crafted and beautifully styled, to help organizations pursue varying marketing avenues with ease. 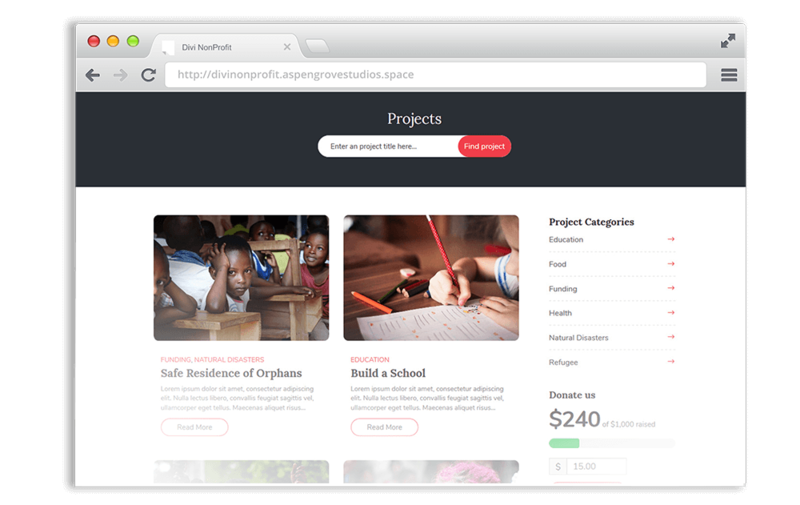 While not limited exclusively to nonprofits, the Divi Nonprofit child theme can be used by just about any brand or business looking to create a beautiful and highly-functional website. 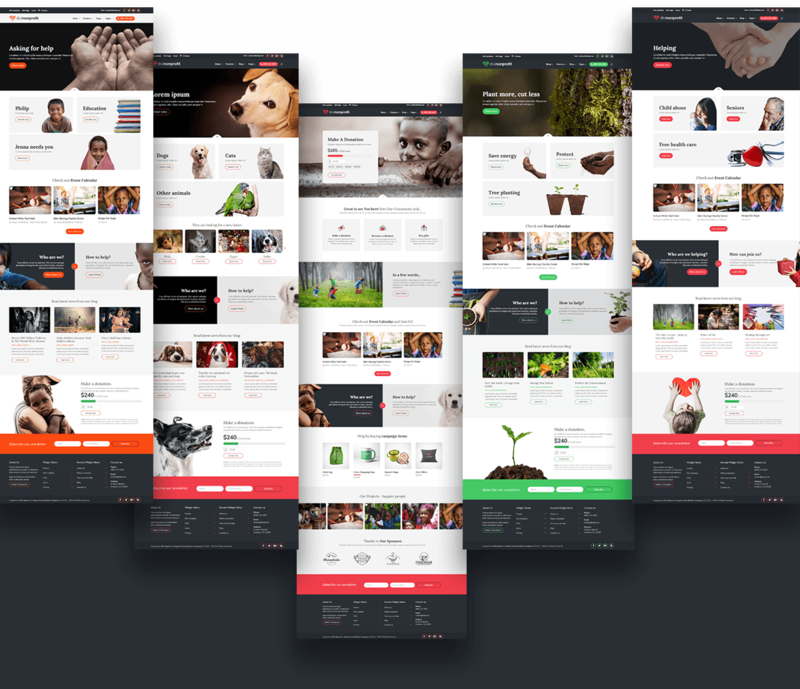 Filled to the brim with a plethora of advanced, premium features, Divi Nonprofit ships complete with a fully set up WooCommerce store, an easy to manage events feature, a Projects and Animals custom post type as well as a custom styled blog. With all of these incredible features built directly into the core functioning of the child theme, Divi Nonprofit goes above and beyond in terms of helping organizations find success online. 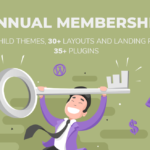 To end off this incredible Divi child theme, Divi Nonprofit ships with a number of bonus features. As well as a custom 404 Error Page and custom styled modules that have been specifically designed to fit the aesthetics of the theme, Divi Nonprofit includes all of the icons and graphic assets as seen in the demo. Perfect for animal rescues or adoption services of any kind, Divi Nonprofit is a completely designed website. From custom templates that showcase and spotlight the subject in need to registration process and pre-screening. With a fully custom designed eCommerce store ready to sell products online, you’ll have everything you need right out of the box after the install. The only thing you will need to do is add your products and start selling! With custom designed project templates you can showcase your good deeds with ease and beauty. 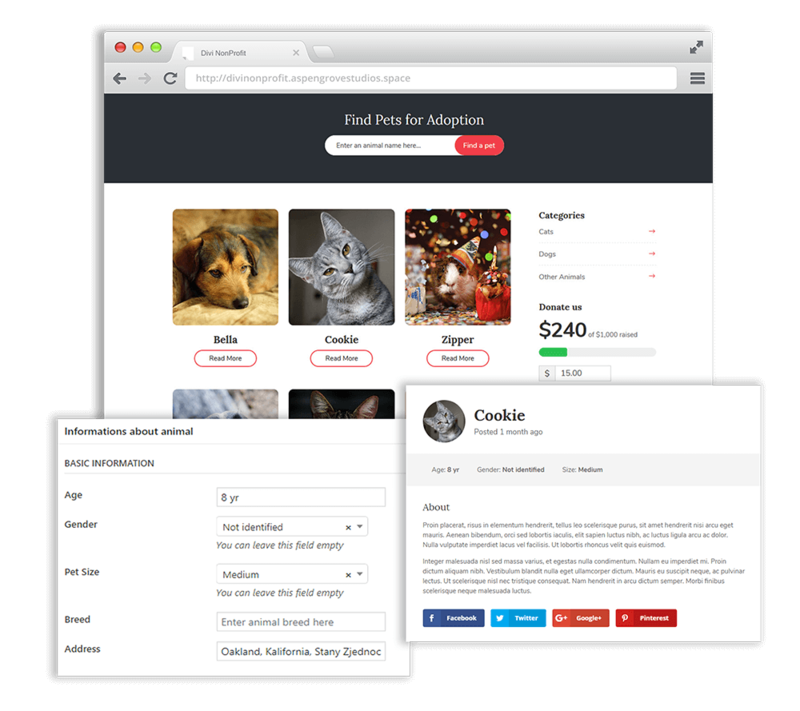 Divi Nonprofit comes built with animal adoption and project templates pre-made and ready to go. But don’t let it stop there, you can add your own brand and create new templates with ease to match your cause. With a fully functional and built in and ready to go events software you can start holding fundraisers with ease and showcasing them to the world. No-one will miss a thing you’re doing with our events scheduler. We have custom designed over 100 hand drawn icons for Divi Nonprofit that you can use and reuse on any project. These icons don’t only have to be used in the theme, feel free to use them in all of your marketing strategies. Lifetime Membership – $399.00Get ALL of our products forever ( certain courses excluded) with a Lifetime Membership! Join the All Access membership and get these and other leading Divi and Extra products for an incredible price. All price options are recurring charges (excluding courses). You may cancel your subscription at any time. Products subject to a yearly license for support and updates. View terms. Need help? Please open a support ticket.